Introduction opens with spaceship in woods…you see the glowing triangular pyramids, some kind of flora-specimen collecting devices…Check the right hand side of scene. For an instant camera pans tree and an animated human face appears in bark, just like the apple trees in Oz. See Minority Report, Poltergeist. Elliot gets tipsy because ET has discovered beer, he lets frogs loose and in pandemonium kisses the girl. Camera closes in to her black patent leather shoes; she kicks out her heel in a move exactly like the one Dorothy uses to show off ruby slippers. 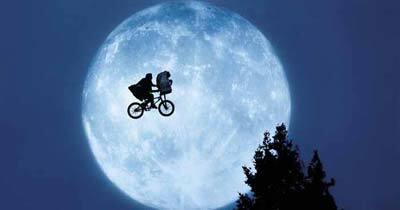 The trailers, posters all featured the key moment when Elliott is speeding away on his bike with ET on handlebars. ET’s magic launches them over the cliff… and then they are flying through the air. 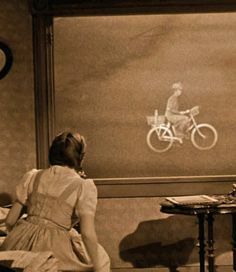 Obvious parallel: Almira Gulch pedaling her bike through the air is straight out of Dorothy’s view of inside the tornado. Apparently the bike scene from ET is one of Spielberg’s favorites. It is now the logo for Amblin, his production company. Spielberg gives his trademark bicycle a cameo in many films. See Munich, Adventures of Tintin, Amistad, 1941, Always, Super 8, War of the Worlds, Empire of the Sun,The Goonies, Sugarland Express, Jaws, Inner Space, Used Cars, Poltergeist. Chimes/clinking are used in this film to foreshadow magic. ET’s jury rigged phone clinks; chimes sound right before the spaceship returns to pick him up; a bell actually rings before the BMX gang all take off into thin air. WOO’s good witch always announced her arrival with magical chimes. See Always, A.I.,The Color Purple, Jaws, Close Encounters, Empire of the Sun, Super 8, Twister, Twilight Zone, Joe vs. the Volcano, Poltergeist. You will see the oft-used backlit, dusty quiet scene when the astronauts first invade Elliot’s home searching for ET, like Dorothy’s house upon landing in Oz— calm before craziness. See War of the Worlds, Minority Report, Twilight Zone, Twister. Also the ‘air of grayness’ that WOO used to portray Kansas is changed to an air of eerie blueness in this scene. And yes WOO’s recurring theme is handled again in this as in many of Spielberg’s films…all ET wants is to “go home.” See Jaws, War Horse,The Terminal, A.I., The Color Purple, Sugarland Express, Close Encounters, Empire of the Sun, Catch Me if You Can, Saving Private Ryan, War of the Worlds, Super 8, 1941, Amistad, Minority Report, Munich, Hook, Poltergeist. Interesting note: The mother protests, “This is my home,” as government officials violate her sanctuary. Home is supposed to be a ‘safe’ place. See Twister, Close Encounters, Empire of the Sun, Catch me if You Can, Minority Report, Amistad, The Color Purple, Munich, Poltergeist. Thanks for visit No Place Like Oz. We're always looking for similarities between the beloved Victor Fleming production and Steven Spielberg's wonderful films. If you have a suggestion, please let us know!